Lying stretched along the equator Indonesia has it all: tropical islands, volcanoes, waves, wildlife, unique cultures and peoples, yummy cuisine. Go for a journey with us - visit places you've never been before, never heard about before. 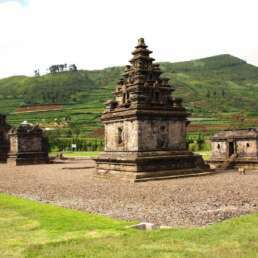 In our blog we write about Indonesia, its culture and rich historical heritage, our travels and experiences. 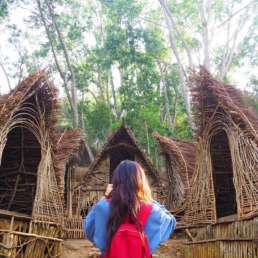 Book a tour now and see the real Indonesia with us! Legong isn’t just a tradition on Bali: it’s an institution. Since the first sightseers arrived on the island in the 1920s, Legong has become the public face of this tiny South-East Asian outpost – a visual emblem that has long promoted Bali’s Hindu culture to millions of eager visitors. But Legong has always been more than just a simple advert to draw the easy evening crowds – and it’s been going on for a lot longer than a hundred years. At first, the young students mirror their teacher’s movements from behind. Later, with growing confidence, their teacher will move behind them to direct their arms and feet. It’s only when the young dancers’ spirits are seen to have infused with the dance’s movements can the girls move with taksu – the Balinese concept of charisma and spiritual power. And only after memorising the complete Legong repertoire can the young protégées think of practising with a full gamelan orchestra. A dancer in the West is pressured to express their ‘inner self’ and their personality to the full. The Balinese dancer, on the other hand, would like to move as far away from the ego as possible – letting the taksu, or the spirit they are playing, to talk and dance for them. Like Balinese painting, it is not about the artist or the finished item – but about the act of submission to a higher being, of self-offering, of briefly being at one with the noetic – the things we cannot see. Balinese Legong Dance (Ubud, Bali). The stage is set. In the 1930s, legongs would dance at village feasts as the cool of the afternoon sun had set in. 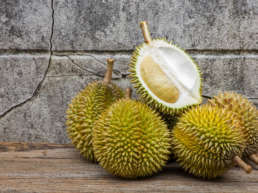 A crowd would gather under a palm-leaf canopy as the gamelan orchestra warmed up, and three little dancers – two legongs and their inclined (‘chondong’), or young female attendant – would take their places at the front of the orchestra. Legong dancers are always sumptuously dressed – wrapped from head-to-foot in silk cloth overlaid with gold brocade, and topped with a headdress of ornamental gold leaf dripping with perfumed jepun flowers. Their faces are always heavily made-up: thickly powdered, with a white dot – the priasan, or mark of a beautiful dancer – between their plucked, black-painted eyebrows. ‘Legong: Dance of the Virgins’ (1935). The legongs’ attendant, the inclined, is always dressed more simply. She stands up lazily and takes centre stage. Quite suddenly, at an accent from the orchestra, it’s as if she’s hit by an electrical current. Her body strikes an intense pose, she starts to quiver, and the electricity shifts from her lightning-fast eyes down to her fingers and back up to the shivering flowers in her headdress. She picks up two hand-fans as a sign that the legongs should join her. Six fleeting eyes and thirty flickering fingers mesmerise the audience until she hands each legong a fan and retires into the background. 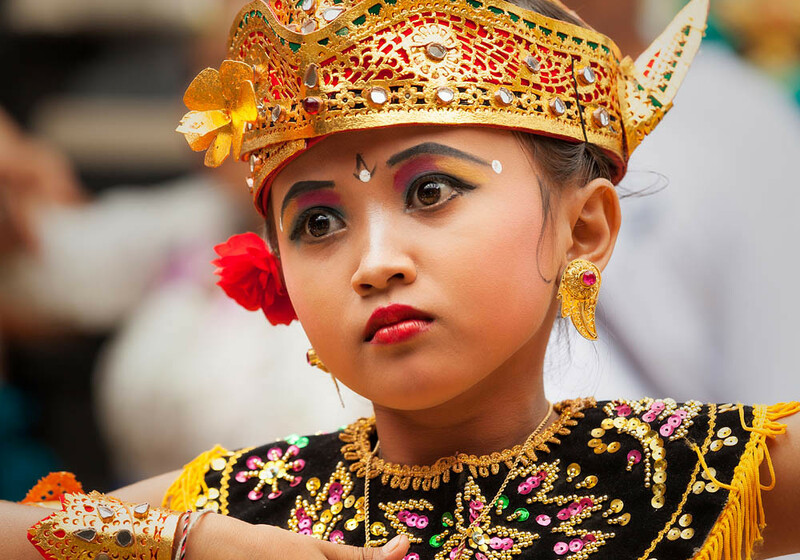 Young Balinese dancer, Ubud, Bali, Indonesia. The two legongs now have the floor to themselves. Like the exquisite lines of a flowing drawing, the dancers morph from one character to the next without interruption; sometimes playing the same character in a tight mirror image before separating again to continue the story’s serpentine narrative. Twin fans flutter like the wings of a hummingbird; necks snap from side to side in perfect synchronisation as their eyes flash and trip to the mechanical pulsing of the gamelan. It is pure, unconfined, abstract pantomime at its best: the young dancers’ spirits lost, for the moment, in another time. Legong dance is pure, unconfined, abstract pantomime at its best. 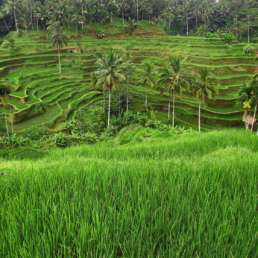 Although you’ll catch brief performances of Legong in many of the island’s 5-star hotels, Ubud continues to be the centre of Legong on Bali. Regular performances by a healthy number of village troupes ensure a dance every evening of the week. The most polished performances are at Ubud Palace (‘Puri Ubud’) and on Monkey Forest Road at the Bale Banjar Ubud Kelod. Get there an hour early to make sure you get a front-row seat, cover up with mosquito lotion, sit back and enjoy the dance of a lifetime. 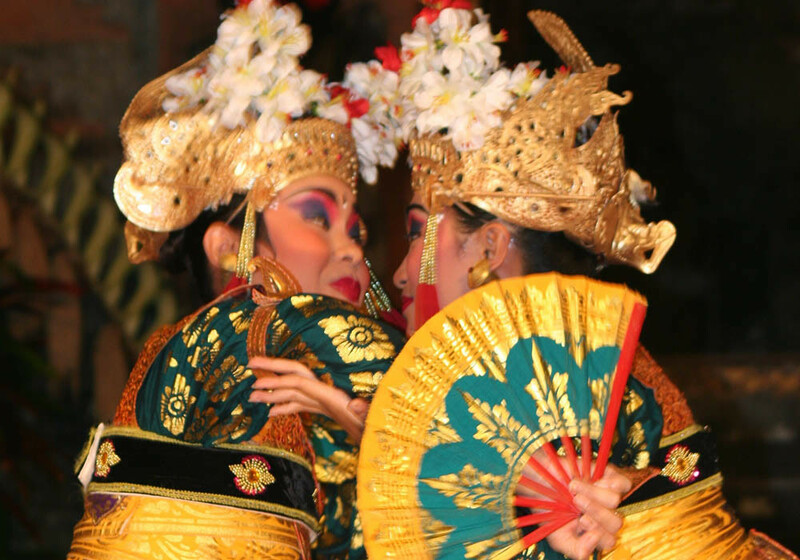 All evening performances in Ubud last for 1 ½ hours, and cost between Rp.80,000 and Rp.100,000. Mature Legong dancers ‘rubbing noses’ during a Legong performance in Ubud. 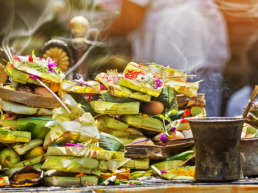 Legong was never danced widely across Bali, with the most famous Legong schools found in Ubud’s Peliatan village and nearby Saba and Binoh. The dance has its feet planted firmly in the past: scholars believe that Legong first appeared as an entity in the 19th century after it split from the sacred trance-dance of Sanghyang Dedari performed by two benignly-possessed pre-pubescent girls. 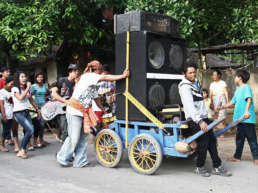 The newer Legong dance is secular – not religious – and was initially performed as entertainment for Balinese nobility before being opened up to the wider Balinese public. And it has evolved again. Now, the lengthy tales of kings and ravens are abbreviated and condensed to appease a different concentration span – and to fit into the tight tourist schedule. Older women of 18 or 30 are also taking on the role. Having danced the Legong as children, they are now teachers in their own right who lend the dance a new beauty and maturity – as well as ensuring that the Legong is passed firmly to the next generation. The Legong dance, like all Balinese performance, has always moved and flowed with the times. But like all dance on Bali it is also, in essence, nothing more than a transient, fleeting, selfless offering to the Gods – the gift of a young soul to the unseen. 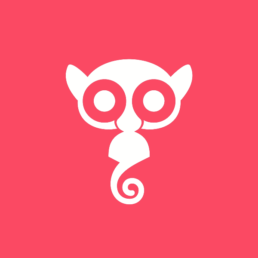 If you think of 'Dayaks', you might just picture a headhunter - and you're not entirely wrong. Before the heavy boots of traders and imperialists set foot on the immense tropical island of Borneo, the Dayak - or 'Dyak' or 'Dayuh' - tribes were the land's original heirs. Traditionally slash-and-burn farmers or nomadic hunters-gatherers living in the mountains or mountains, the Dayak people deservedly acquired a reputation reputation for their head-hunting practices - or Ngayau. 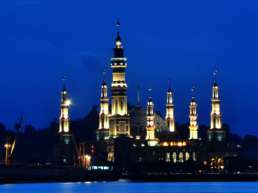 Samarinda's city center is certainly not one of the most distinguished, or visually arresting - and the small and decent hotels, thousands of thousands of people who are haphazardly sprawl over the surrounding hills. 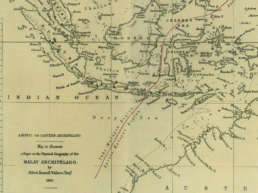 Before the vanguard of the United East Indian Company - the Vereenigde Oost-Indische Compagnie, or 'VOC' - landed on Java in 1595, the Malay archipelago was already a booming trade zone. The East Indies - now modern Indonesia - was a melting pot of missionaries, traders and adventurers selling religion, spices and gold. Geography and history define the Sasaks - who are indigenous people who make up 85% of Lombok's 3 million people. 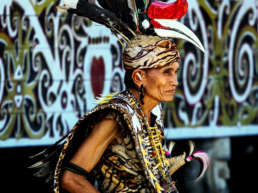 Their language, religion, architecture, dances and music are the marriages of sailors, conquerors, artists, political outcastes, who have given the Sasak their unique people, spicy flavor. Indonesia can boast everything that Zappa dreams of - except that the archipelago hasn't gone nuclear. 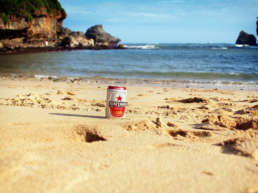 The Republic of Indonesia isn't exactly virgin when it comes to brewing beer, and she prides herself on three locally-created ales - the ubiquitous Star Pilsener; The star is cheaper, more bitter sidekick Anker; and Bali's niche, sickly-sweet Bali Hi. 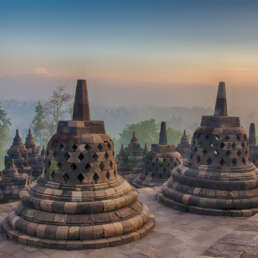 Borobudur VW Tour "Tracing every corner of the specialty of the Village around Borobudur"
If you are traveling by speedboat from Bali to Lombok's Gili Islands, you might find yourself gripping ever more tightly onto your seat as the sea begins to swell and the waves begin to balloon. It can be a scary ride. The Lombok Straits that divide the Indonesian islands of Bali and Lombok stretch to more than a kilometre deep. The straits are a narrow, rowdy meeting point where the warm Pacific Ocean squeezes into her colder Indian cousin. 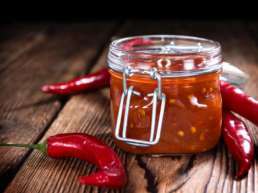 It's a five-star restaurant or a food-stall, you're never far from Sambal in Indonesia. Sambal for your average Indonesian is like American ketchup tomato: it goes with everything. Rice or stir-fry, beef or fish, this all-purpose fiery, tangy relish comes in hundred flavors. Coordinating group travels is not an easy task - which is why we are here to help. 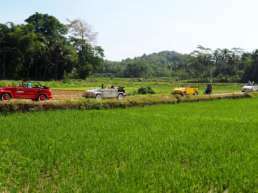 We have experience in arranging tours for large groups of 10 - 200 participants and we offer unique and rich tourism programs.